In December 2011, I completed a three-week trip of the Philippines, visiting the islands of Luzon, Mindanao and Palawan with a half-day + overnight stopover in Cebu. 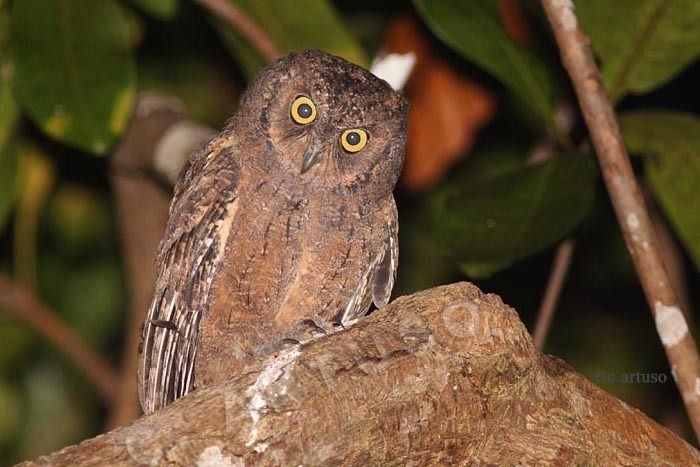 I will post a series of five blog posts about the birds of the Philippines, focusing on the exceptional endemics. This first posts deals with the night birds throughout the archipelago. As it turns out, due to extremely poor weather with a typhoon and seemingly endless rain, my collection of photos of the 9 species of owls I saw is meager. 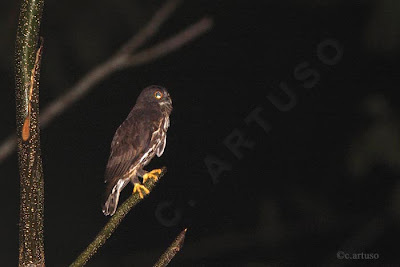 We start on Cebu with an owl nicknamed “Cebu Hawk-Owl” or “Cebu Boobook” if you prefer. Owls in the genus Ninox, whose distribution is predominantly in the southern hemisphere, often go by the common name of either boobooks or hawk-owls. and should not be confused with the Northern Hawk-Owl (genus Surnia). They typically have round heads, longish tails and wings and a large cere with the nostrils visible on top of the cere as opposed to on the side. The Cebu Hawk-Owl is a member of the Philippine Hawk-Owl superspecies complex, whose species limits are rather unclear; however, there is increasing consensus that this particular taxon should be considered a separate species endemic to Cebu. If treated as a separate species, this species would probably warrant a status of endangered, as with the other Cebu endemics the cling on desperately in the few remaining patches of forest on their island. The first two photos show a pair calling with the classic posture, wings half dropped and quavering. I assume this to be a male and female based on song pitch and size but also note the colour dimorphism. These next two photos show the pair together and interacting in what I assume was a courtship display. In the second photo you can see their inflated white throats and the size and colour difference are clearer. 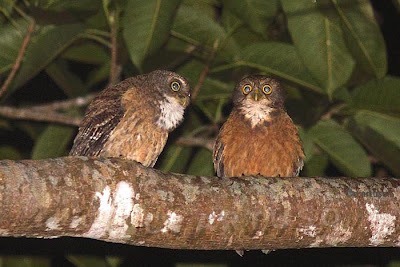 Also in the genus Ninox but much larger than the Cebu Hawk-Owl, this owl has the great name of Chocolate Boobook (note the dark plumage). 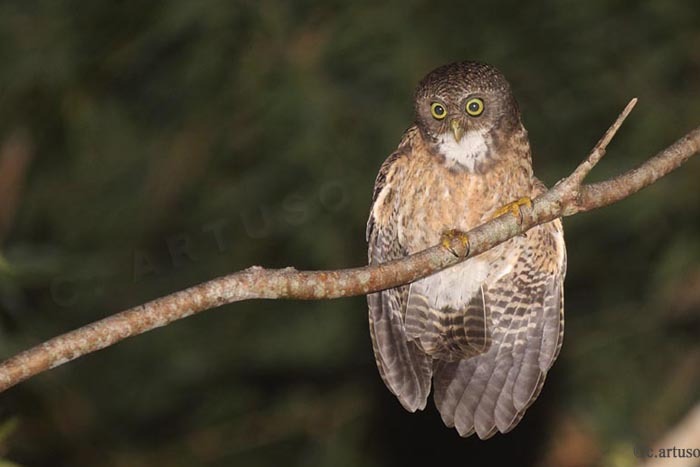 Formerly considered to be a subspecies of the widespread Brown Hawk-Owl, and still treated as such by König 2008, this taxon is now generally regarded as a Philippine endemic species. This photo was taken on Mindanao. Also on Mindanao, but endemic to that island and near neighbours, is the enigmatic Giant Scops-Owl. This poorly known species is listed as globally Vulnerable by Birdlife International. 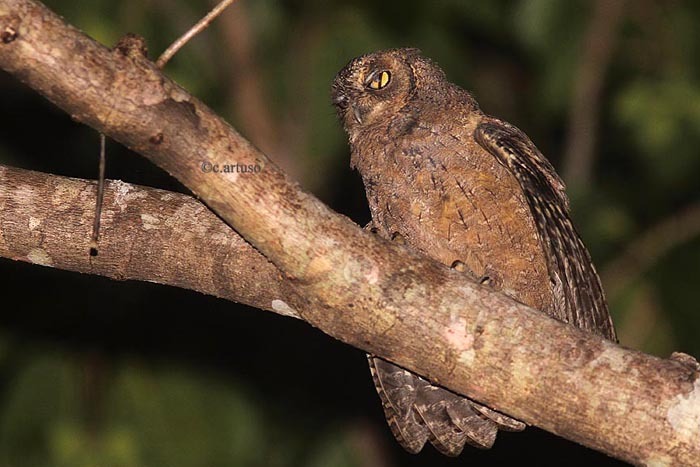 The affinities of this species are a bit of a mystery as it is intermediate in size between most scops-owls (Otus) and eagle-owls (Bubo). 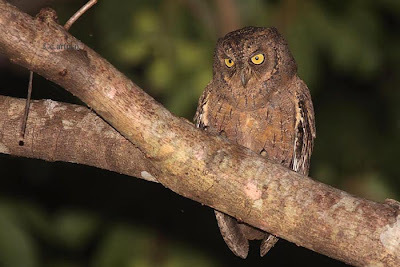 Thanks to genetic analysis, it is becoming clear that this taxon’s affiliation is closest to the scops-owls; however, it is still distinct enough to be considered a monotypic genus Mimizuku. 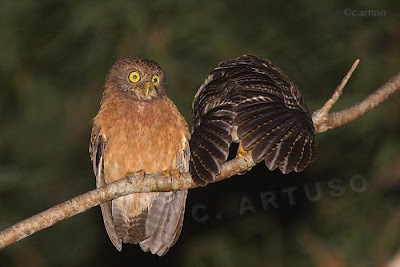 Unfortunately, it still goes by a confusing array of common names such as the frustratingly inaccurate nomenclature of http://www.ebird.com/ that lists this birds as Mindanao Eagle-owl. 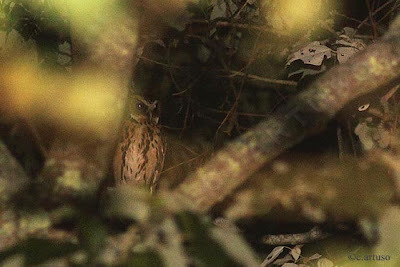 Although I never managed a great photo, I spent three night on Mount Kitanglad searching for this owl, in the rain half the time, before finally tracking down this individual. Next is the Mantanani Scops-Owl (a true member of the genus Otus) that I photographed on Pandan Island off Palawan. This is a fascinating species that is confined to small islands where other congenitors do not occur. It is endemic to the small islands in the Sulu Sea between Borneo and The Philippines and because of its restricted range and increasing human presence on those islands this species is listed as Near-threatened. Here are two more photos of the same species. The first shows a bird giving their gruff territorial song and the second shows the nictating membrane half closed (transparent third eye lid that closes sideways to protect the eye). 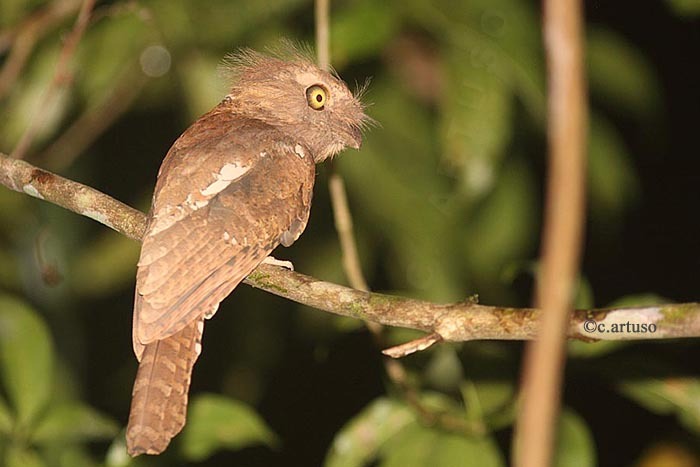 In addition to the owls, the Philippines is home to two fascinating species of frogmouths. 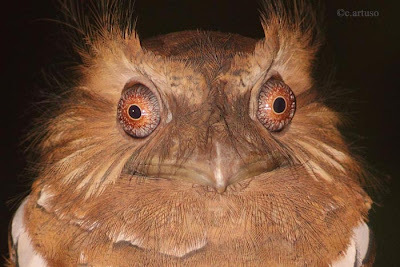 Frogmouths are such bizarre looking birds, the Australasian – Australian equivalent of the potoos of the Neotropics. Their freakishly evil-sounding calls can send a chill down your spine if you have wandered into the forest at midnight (or delight you as the case may be). They catch insects in flight with their massive bills and sensitive rictal bristles. By day, they roost on bare branches relying on their camouflage. 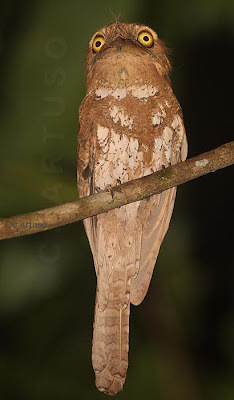 The first set of two photos shows the Palawan Frogmouth, endemic to Palawan but formerly considered a race of Blyth’s Frogmouth, which in turn was formerly considered conspecific with Javan Frogmouth (splits on splits). The first photo shows a dorsal view and offers a good look at the intricate “whiskers”. The second photo shows the ventral view and the extraordinarily wide gape, plus of course the brown and white pattern that provides optimal camouflage by day. 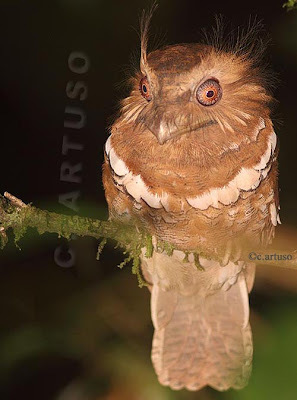 And here is the Philippine Frogmouth, found on most of the major Philippine islands except Palawan. 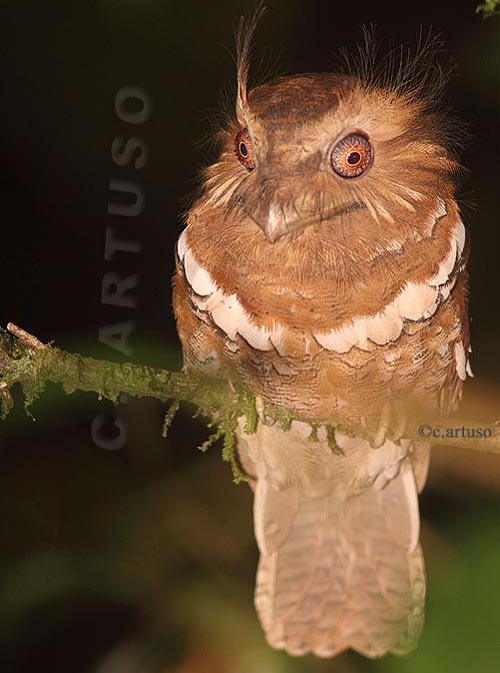 The first photo shows the whole bird with their classy white "braces" and the second photo is a close up of the bizarre froggy face… these birds have such character... and check out the eyes! Those are so really interesting looking birds! That last photo is unbelievable! Amazing! Great shots and blog Christian! A new paper by Rasmussen et al. 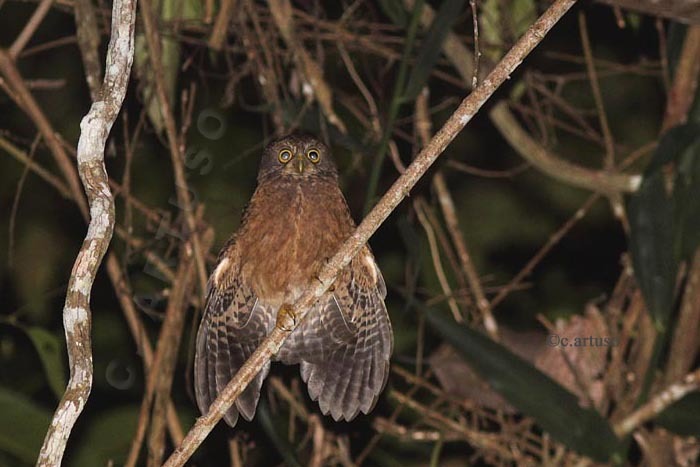 in FORKTAIL 28 (2012): 1–20 proposes full species status for the Cebu Hawk Owl as Ninox rumseyi and others in this complex. The first photo is this post is featured in Figure 6 of that article.